From left: Taylor, Jan, Tara and Jordan Roeder. (Editor’s Note: This feature was written by Meredith Marsh, University of Findlay riding instructor and director of the Equestrian Studies and Equine Management Program). The University of Findlay’s Equestrian Studies Program has a long and storied history of graduating highly successful horsemen and women. In the western program, students study under some of the best and most well-known instructors in the industry who educate on all western disciplines from reining and cutting, to trail and western pleasure. One of the founding principles that guided early instruction is the belief that giving students a wide breadth of knowledge will provide them with the tools and techniques needed to be successful in any area of the horse industry. And the expanding list of alumni accomplishments indicates that, even in times of increased specialization, a well-rounded approach to education continues to work. Jan Ladd-Roeder ‘89 is an excellent testament to this educational approach. Jan, whose story exemplifies personal and familial success in the equestrian realm, grew up around her parent’s Standardbred racehorses, riding in all events at her county fair. At UF, at the insistence of her parents who wanted to make sure that she would be a graduate with diversified skills, she double majored in equestrian studies and education. “I just knew I wanted to train horses, I didn’t care what discipline,” Jan said. She also wanted to teach. “I loved helping the youth kids show in the all-around events. And, by the time I graduated I knew I could make a nice horsemanship horse and mold it to fit its rider,” she said. During her college years, Jan rode horses after class with past instructor Dan Huss, and she worked for past western program director Steve Brown as an assistant to his training business. Also, during this time, Jan married her college sweetheart Phil Roeder ’87, a business major who was always supportive of her horse endeavors. “Balancing the demands of being a student in a rigorous equestrian program while also establishing your identity is just not easy for anybody. It helps to have someone who supports you and believes in you,” she noted. In 1992, Jan’s love for teaching led her to a riding instructor position at UF. Jan taught alongside her own past instructors: Brown, Huss, Cindy Morehead and Robin Koehler who also started instructing at UF in 1992 and quickly became a lifelong friend. To stay current and connected in the industry, Jan started Roeder Performance Horses, operating out of the western farm. Jan worked with youth and amateurs of all levels, training and showing their horses and coaching the riders to high level success at 4-H, open shows and breed shows. In 1996, Jan and Phil’s first daughter, Tara, was born, followed by Taylor in 1999. Jan continued to work for UF and manage her training business, but her growing family took precedent. She cut back on her hours, but made things work by riding during her off hours and bringing her girls to horse shows. 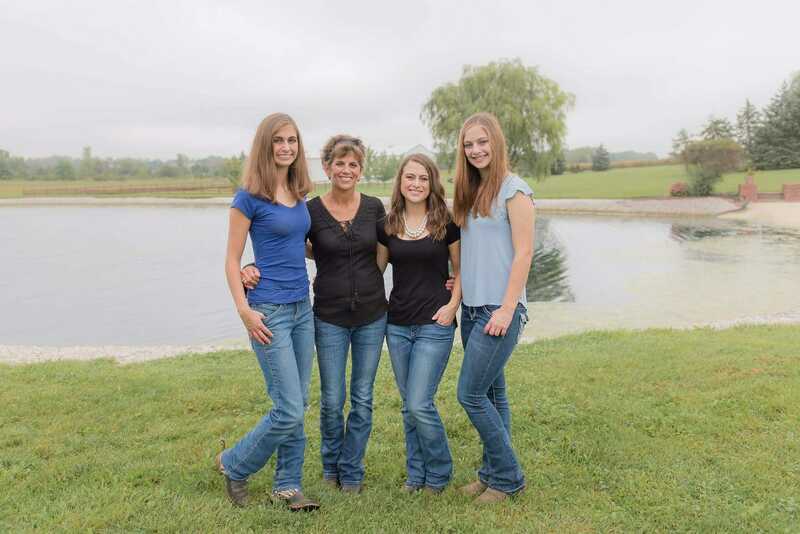 In 2002, following the birth of her third daughter, Jordan, Jan decided to resign from UF to spend more time raising her young family, but her love of horses never dissipated. That interest soon rubbed off on her daughters, who also became involved with horses at early ages. The pony business grew, with Jordan eventually taking over its reins. The Roeders were known as the people to contact when the parents of a horse crazy kid were looking for a mount. “The ponies really taught the girls so much. They saw how all of the disciplines relate to each other, and even how to evaluate potential in a sale prospect. The ponies taught them about hard work and dedication, and about risk and reward,” Jan added. Taylor had matured during her time riding the ponies and finally, in 2011, Jan bought Taylor her first reining horse. “Taylor’s first horse, Ms White Cinch, taught her so much about reining. I had her take a few lessons with some of the UF instructors who specialize in reining to get her started, and then I was able to keep the mare tuned up for Taylor at home,” said Jan. And the program worked; Taylor had great success with her mare, ending up Reserve Champion at the All American Quarter Horse Congress. Jordan started showing in walk/trot classes at breed shows when she was eight, and by the time she was 11 years old, she too was riding reiners. Jordan started her reining career on Electric Razor, whom she showed for two years. “Razor was just a great horse. He was kind and forgiving and really took care of Jordan out there,” said Jan. In Jordan’s first two years of showing in reining classes, the team ended up in the NRHA (National Reining Horse Association) year-end Top Ten for the Youth 13 and under division both years. In 2015, the Roeders purchased Gunners Silver Star, affectionately known as “Tiger,” to be Taylor’s show horse. The following year, Taylor showed at the first show of the year in Florida and “they did well,” according to Jan. Actually, they did really well, sweeping the Youth 14-18 classes. Taylor and Tiger kept showing consistently strong at NRHA shows all spring, and then, mid-year, Jan realized that Taylor was in the lead for the Youth 14-18 Top Ten. “At that point in the year, we just added a few more shows to our schedule and kept going. I figured Taylor and Tiger would tell us how much we should push for this. But they just stayed consistently at the top of most of their classes,” Jan explained. Taylor ended the 2016 show year with 328 points, and was crowned the NRHA World Champion Youth 14-18. Towards the end of 2016, Jan purchased the horse Nimble Walla Walla, known as “Walle”, to be Jordan’s show horse for the 2017 season. And, in what was soon to become typical Roeder fashion, Jordan and Walle started the year with several wins. “We had no plan to go for another title. There was no way I was planning to haul two years in a row! They just came out of the gate strong at the first few shows, then started really clicking together about mid-season. We were on a roll, so we just went with it and tried to use it to our advantage. Their perseverance paid off. Jordan finished a very tight race with 314.5 points and was crowned the 2017 Reserve World Champion Youth 14-18. But this incredible accomplishment does not lie solely in those two back-to-back world titles. Within five short years, Jan developed a clearly successful program to maintain and show reining horses and coach her daughters, all while balancing family life and school activities, and instilling important lifelong lessons of commitment, work ethic, sportsmanship and maturity.